The tower is the primary television and radio broadcast site for the Kantō region; the older Tokyo Tower no longer gives complete digital terrestrial television broadcasting coverage because it is surrounded by high-rise buildings. 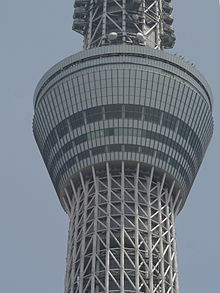 Skytree was completed on 29 February 2012, with the tower opening to the public on 22 May 2012. The tower is the centrepiece of a large commercial development funded by Tobu Railway and a group of six terrestrial broadcasters headed by NHK. Trains stop at the adjacent Tokyo Skytree Station and nearby Oshiage Station. The complex is 7 km (4.3 mi) north-east of Tokyo Station. As the Skytree's opening approached, people reportedly waited in line for a week to get tickets. By the opening, trips up the tower were fully booked for the first two months of operation. The opening day drew a crowd of tens of thousands, despite rainy conditions which blocked the view from the tower's observation deck. Contact the sales team at 24 Limousine and we can arrange an english speaking chauffeur to take you to & from Tokyo Skytree. I will be a day you will not forget.